Cirrhosis is the final stage of liver disease. The fibrous tissue caused by cirrhosis prevents your liver from functioning properly, including metabolizing and storing nutrients. One of the nutrients affected by cirrhosis is protein. The cirrhotic liver causes your body to breakdown proteins at a fast rate, quickly depleting stores and increasing your needs. However, some people with cirrhosis have high levels of ammonia, a by-product of protein metabolism, in their blood and may need to restrict protein intake to prevent adverse effects. Malnutrition is common in patients with cirrhosis. This is due to a poor appetite and intake, malabsorption of nutrients and impaired nutrient metabolism. Malnutrition increases your risk of disease and death. While your protein breakdown is elevated with cirrhosis, synthesis is decreased, which causes muscle wasting and a decrease in blood protein. Getting enough protein in your diet to meet your needs is essential to maintain adequate levels of protein and prevent further illness. While getting enough protein in the diet is essential for good health when you have cirrhosis, there is one instance when you may need to limit your intake. Hepatic encephalopathy is a condition that occurs in people with cirrhosis because their livers can no longer remove toxic waste from the blood. Hepatic encephalopathy causes confusion, disorientation, slurred speech and personality changes. Ammonia is one of the toxic substances attributed to causing hepatic encephalopathy. In some cases, if no other treatment works, including medication, you may need to restrict your protein intake to lower ammonia levels and improve hepatic encephalopathy. Protein needs for cirrhosis vary depending on your degree of illness. Individuals without any complications need 0.8 g to 1.0 g of protein per kilogram of body weight. So, if you weigh 150 lbs., you need 55 to 68 g of protein a day. If you have low protein stores and a decrease in muscle mass, you need 1.2 to 1.5 g of protein per kilogram of body weight, or 82 to 102 g of protein if you weight 150 lbs. If you need to restrict your protein because of hepatic encephalopathy, it is recommended you limit your intake to no less than 50 g a day. To meet your protein needs, try to include 4 to 6 oz. of meat, as well as 1 to 2 cups of milk a day. These foods are high quality sources of protein, providing your body with all of the essential amino acids it needs to build the proteins in your body. 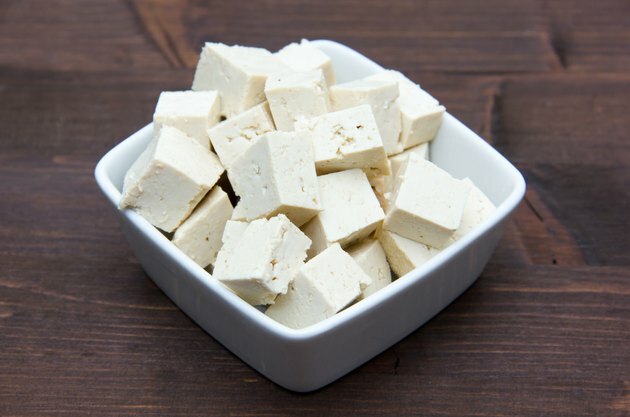 Eggs, tofu and soybeans are also high-quality sources of protein.